For as long as I can remember, the Middle East has been in turmoil. Arabs and Jews appear to have been at each other’s throats since the day Israel was reborn as a modern nation in may of 1948 (that very day also being known as “al-Nakba” or “the Catastrophe” in the Islamic culture). Being a Jew born and raised in Paris and as a child of Holocaust survivors, I grew-up in a culture that instilled in me the reality of anti-Semitism as well as the existing hatred between Arabs and Jews. While my own family never taught me to retaliate evil for evil, there was always an underlying uneasiness about “those Arabs who hate us!” as I often heard growing up. Then I met my Messiah in the summer of 1981. While my growth in Yeshua (Jesus) was slow at first, it was steady and I grew increasingly aware of God’s love for ALL people, Jews, Arabs and anyone else. As difficult as it was for this Jew to really accept that concept, as a follower of the Messiah, I had no other choice but to accept that God not only loves all, but that He also requires us to love all, including our enemies: “But I say to you, love your enemies, and pray for those who persecute you.” (Matthew 5:44). This is why I am deeply saddened AND concerned by the recent conference known as “Christ at the Checkpoint” (CatC) that took place March 5-9, 2012 at Bethlehem Bible College. This was the second of its kind after the one that took place in 2010. The subtitle of the conference was “hope in the midst of conflict”. The theme was advertised as being “peace and reconciliation”. In and of themselves, both the title and theme are commendable efforts to be recognized by anyone, assuming they are an accurate and ethical description of the events that took place. As it turned out, following in the footsteps of the 2010 conference, the 2012 event did not have reconciliation at heart, unless of course reconciliation was the result of a unilateral admission of Israel’s faults in the Middle East crisis. This would of course require recognizing Israel as a guilty occupier and perpetrator of crimes against humanity, hardly a fact! Additionally, CatC organizers including blatant anti-Zionist and anti-Semitic Stephen Sizer, also published a manifesto that was agreed upon and signed by all organizers. While that manifesto contains some truth, it is ambiguous and misleading at best, but also rather libelous in some cases. A closer look at it in light of God’s Word is necessary. Following in bold is the exact text of the manifesto along with Scripture to either validate its truth or rebuke its error. AGREED: God created man and woman in His image, regardless of ethnicity. (Genesis 1:27; 5:1; 9:6; 1 Corinthians 11:7; Ephesians 4:24). DISAGREED: It must be understood first and foremost that the Land of Israel belongs to God Himself (Leviticus 25:23). God chose to make a covenant with Abraham that would include that piece of land as an eternal AND unconditional part of that covenant. Additionally, God’s gifts are irrevocable (Romans 11:29). PARTIALLY AGREED AND DISAGREED: While nobody enjoys living in a land that they feel is theirs and is occupied by a foreign people group, it remains to be proven biblically that Jewish people are the occupiers. All previous Scriptures cited about the Land lead to an opposite view (See verses under points 3 and 5). AGREED: While it is possible to disagree with Israeli policies, much of what has been labeled as anti-Israelism or even anti-Zionism has really been anti-Semitism in disguise. Genuine Christian love is at the core of any reconciliation and is irrespective of color or race. (2 Corinthians 5:14; Ephesians 3:19; Colossians 3:14). AGREED: While again I find the statement misleading as it could be taken to mean that there is a justification for radical Islam’s violence, I agree that Christian love is always to be the foundation of any lasting peace and reconciliation (See verses under points 6). I recognize that the breaking down of the manifesto into sections to be either supported or refuted by God’s Word is non exhaustive at best. Nevertheless, it provides a bit more of a biblical foundation on which to rest for a more balanced approach to the Middle East conflict. While CatC appears to seek justice and to be interested in hearing both sides (thus the few messianic pro-Zionists on the list of speakers), it is still obvious to me that the scale was heavily tipped by anti-Semitism at worst, and anti-Israelism or anti-Zionism at best. Unfortunately, the very fact that some evangelicals participated in the conference and that many more will endorse its false agenda of “peace and reconciliation” is proof to me that the Body of Messiah has lost its sense of discernment, an issue that we have been warned about regarding the last days. I solemnly charge you in the presence of God and of Messiah Yeshua, who is to judge the living and the dead, and by His appearing and His kingdom: preach the word; be ready in season and out of season; reprove, rebuke, exhort, with great patience and instruction. For the time will come when they will not endure sound doctrine; but wanting to have their ears tickled, they will accumulate for themselves teachers in accordance to their own desires; and will turn away their ears from the truth, and will turn aside to myths. But you, be sober in all things, endure hardship, do the work of an evangelist, fulfill your ministry. (2 Timothy 4:1-5). Two States, One State, No State: Israel Must Get out of the Way! One thing that the enemies of Israel have in common aside from their passionate desire to see that tiny strip of land obliterated, is that they are very creative in their ways to promote her destruction. It does not matter that Israel became a modern nation in May 1948, after vindication by the UN vote (33 Yes and 13 Nos) in November of 1947. It does not matter that Israel is the ONLY democracy in the middle east where many Arabs are better treated than in their own respective countries, and it certainly doesn’t matter that God Himself covenanted with Israel and the Jewish people so that Israel would never be destroyed (Genesis 12:1-3; Jeremiah 31:35-37)! From the moment Israel was reborn as a modern nation, neighboring Arab countries and soon after other worldwide countries started to work overtime on a plan to thwart her growth if not her very existence. As it turned out, the UN, the very organization used as a platform to Israel’s rebirth out of the ashes of the Holocaust, has passed more resolutions against Israel since 1948 that any other country in the world. Today, many solutions are brought forward to bring peace in the middle east between Jews and Arabs. While common sense dictates that any good solution requires compromise which is a bilateral effort, the options presented to Israel seem to be unilateral at best. At the end of the day, the destruction of Israel is always part of the equation, either in an obvious or insidious manner. Three recurring options can be defined. Based on direct negotiations between Israel and the Palestinian Authority, the Two-State Solution envisions two countries side-by-side: Israel and Palestine, carved out of the Land currently know as the State of Israel. Constant disagreements pertaining to borders and sensitive areas such as the Temple Mount have rendered the Two-State solution very unlikely. Yet it continues to be pursued. Regardless of the numerous geographical, political and spiritual roadblocks, many countries have pushed for Israelis and Palestinians to “get along” and live side-by-side. Just about all American presidents have tried to bring about a Two-State Solution since the first attempt was presented by the Peel Commission Report of 1937 under the British Mandate of Palestine. Beyond governments, grass root movements such as Christ at the Checkpoint (CatC) have organized conferences (2010 and upcoming in March 2012) at the Bethlehem College of the Bible. Under the guise of hope, peacemaking and reconciliation, this gathering turns out to be a hateful parade of politically correct pro-Palestinians and anti-Zionists wanting nothing less than Israel admitting her “colonialist” approach to the middle east crisis. Their agenda is only fueled further by recent movies such as With God on Our Side or Little Town of Bethlehem were Israel is clearly (but inaccurately) represented as the oppressor or “New Nazi of the Middle east” creating an “apartheid nation”. Both movies are boldly endorsed by an array of Evangelical Christians. Even though many Israelis and Palestinian might genuinely be in favor of a Two-State Solution, the Palestinian leadership has made it impossible to achieve, especially when one looks at their unilateral demands. The Two-State solution is NO SOLUTION! Another way to possibly solve the volatile situation in the middle east is to create a One-State Solution. The current boundaries of the State of Israel being used as the One State where both Israelis and Palestinians would coexist. This solution is usually favored by Israeli Arabs while it receives very little support from Israeli Jews. It has found much support in academic circles worldwide where for ideological reasons if nothing else, it seems to be the most viable option. Incidentally, if Israel remained the sole nation under the One-State Solution, Israeli Arabs would benefit from the perks of the only democracy in the middle east (not to mention the treatment of women under Muslim rule). The One-State Solution with both Palestinian and Israeli receiving identical citizenship would only lead to an steady increase in Palestinian birthrate thus forwarding the Palestinians to the forefront demographically and eventually politically, giving them a majority in Israeli government. I will let you imagine the rest of the story. As ludicrous as the solution might be, it is very popular in academic circles as we can see by the upcoming conference to be held at Harvard University on March 3 and 4, 2012 known as the One State Conference. This conference of hatred includes speakers such as Ilan Pappe (a radical Jewish leftist), Ali Abunimah, Executive Director of The Electronic Intifada and many other highly biased pro-Palestinians. The One-State solution is NO SOLUTION but a DISSOLUTION of the State of Israel waiting to happen! Ahmadinejad is laughing at Western Civilization’s impotence as he fine tunes his nuclear arsenal. A No-State solution is obviously NO SOLUTION, yet all factors indicate that Iran is months away from having enough nuclear power to eradicate Israel and even parts of the United States. What a relief though, that the God of Abraham, Isaac and Jacob holds Israel in the palm of his hands and considers the Jewish people as “the apple of my eye” (Zechariah 2:8). Yet, there is one state that is most important to all, and that is the state of one’s heart. We must all give our heart to God by accepting the free gift of salvation and the only possible reconciliation between Jews and Arab, and that is the death and resurrection of Yeshua the Messiah for all people. (Isaiah 52:13-53:12, John 1:12, Romans 6:23). Only through Yeshua’s love can enemies be reconciled. The state of your heart is the only one state that matters to God so consider giving it fully to Yeshua! Israel, Who Are Your Friends? Not one day goes by anymore without Israel or the Jewish people being mentioned somewhere in the media. Today, it is becoming incredibly difficult to determine who the friends of Israel are, if any are left. From replacement theology to B.D.S (Boycott, Divestments and Sanctions) or from anti-Semitism to Christian Palestianism, the world is increasingly turning its back on Israel and the Jewish people. I will bless him who blesses you and I will curse them who curse you. This simple agreement that God made with the Jewish people through Abraham, includes the rest of the world as either those who bless or those who curse. There are only two choices there, and only one is worth making. Identifying Israel’s foes is not always a difficult task, like for instance in the case of anti-Semitic acts perpetrated by KKK or neo-nazi fringe groups. Just a couple of days ago in a Brooklyn neighborhood, several cars were torched swastikas were spray painted on public benches along with anti-Semitic messages written on the sidewalks and KKK painted on the side of a van. It all took place the day before the 73rd Anniversary of Krystallnacht. “The Night of Broken Glass” happened on November 10, 1938, when simultaneous violent attacks on Jewish businesses, Synagogues and properties occurred all over Germany. Krystallnacht was a new phase in anti-Semitism and it helped it reach a point of no return believed by most historians to be the official starting point of the Holocaust. Hate crimes like the one in Brooklyn happen regularly in the U.S. and even at a faster pace in Europe. For instance, and again they fall under the “easy-to-identify” category, posters were plastered all over Paris starting on November 5, depicting the hand of an Israeli soldier stabbing a Palestinian child to death using a knife shaped like the map of Israel. Muslim hatred for Israel has become such an accepted “fact of life” that most of the civilized world has become desensitized to any display of anti-Israel or anti-Jewish sentiment. Yet it is on the increase. Neo-Nazis and Islamists are expected foes of Israel and the Jewish people, but what about the Christian Church? Don’t Christians owe their Bible to the Jewish people? Isn’t Yeshua (Jesus) the Messiah, a Jew in His humanity? Shouldn’t the Christians be supportive of the “People of the Book”? United Methodists have recently passed Resolution No 11-16 Aligning United Methodist Church Investments with Resolutions on Israel/Palestine. In that resolution, the Board of the United Methodist Denomination voted in favor of divesting money from Israel because of what they call the “Occupation of Palestinian territories”. Other denominations have followed and more will undoubtedly join. A simple but honest study of history will suffice to prove that the Palestinian people were invented in the mid-sixties to promote Yasser Arafat’s agenda of Israel’s takeover and the destruction of all Jews. The agenda still goes on and has now been accepted by the uneducated masses, as it is greatly facilitated by the liberal media. A large portion of western civilization is in cognitive dissonance when it comes to Israel’s right to exist AND right to the land, and unfortunately, it includes a vast majority of “Christians”. What a shame for a follower of the Jewish Messiah and His message of hope to want nothing to do with the original messengers. Other Christians believe that the Church has replaced Israel in God’s plan. The Jewish people had their chance but they rejected Jesus so God rejected them. This theology of replacement is being taught all across America and worldwide by too many pastors and theologians. But the Bible teaches the opposite (see Romans 9-11). Israel is very much in God’s plan, and as a matter of fact it is in the center of God’s plan for all of mankind. Then there are some Christians who under the guise of “loving Israel” will refrain from sharing the Gospel with anybody Jewish. “So much has been done against the Jewish people in the name of ‘Christ’ that today, we need to just love them” they say. I believe that hugging and loving a Jewish person while refraining from sharing the Gospel with them is the worst form of anti-Semitism that exists. So, with such a gallery of foes, can we still find any friends for Israel? Who are those who choose to bless Israel? There are still some evangelical Christians who love and support Israel. When it comes to giving, financial support is good, but the most important gift is the one that never stops giving, and that is the gift of eternal life through the Gospel. Bible believing followers of the Jewish Messiah cannot call themselves Christians and hate Israel, because by doing so they also hate the God of Israel (Psalm 83:1-5). There are still Christians who want to bless the Jewish people. I was led to my Jewish Messiah by such a person 28 years ago. If we love Israel, we must support her with all of our heart and soul, against the evergrowing faction of foes such as neo-Nazis, Islamists, liberals and even many Christians. To be sure, I do not mean that we must accept every move that the Israeli government makes without any criticism, but biblically, the Jewish people ARE STILL the chosen people of God. We are soon to enter into a presidential election year. Never in the history of the United-States has a government been so anti-Israel and pro-Palestinian. The ice is getting thinner (and this is not in reference to global warming). America is still a blessed land of opportunity, but we should tread very lightly. If our country turns its back on Israel, don’t act surprised if God turns its back on our country. Occupy Wall Street and Vilify Israel! The bank-controlling “Greedy Jew” syndrome is not new. Slogans such as “Zionists control Wall St”, “Hitler’s Bankers Wall St.” or “Humanity versus the Rothschilds” heard and/or read at the Occupy Wall Street gathering and other “Occupy ‘Your Home Town'” around the nation are nothing but a repackaging of an old anti-Semitic libel. As a matter of fact, it is one of the oldest libel against my people that goes back to the Middle Ages. Around the time of the First Crusade of 1096. One of the results of the Crusades was that many new routes became open to the Orient and money was quickly becoming the primary commodity for trading. Money lending was forbidden by the Church, and Christians were allowed to borrow money ONLY from Jewish people, who in turn would collect the money back with interest (one of the few ways for Jewish people to make a living back then). The Kings of Europe started taxing the Jewish moneylenders on their profit. Taxes kept increasing, so the Jewish moneylenders had no choice but to increase their interest rates to continue to simply make a living. The process went on for a while and gave birth to the myth of the “greedy Jew”, a myth picked up in Shakespeare’s Shylock character and that is obviously still going strong in the 21st century. So much so that today it is not uncommon to hear people with no anti-Semitic inclination say: “he Jewed me down!” referring to a transaction where bargaining took place in an effort to reduce cost. People for the most part have been desensitized, as the myth of the “money loving Jew” continues to infiltrate all segments of the population with its pernicious and libelous message. Now we witness its resurfacing at the various Occupy Wall Street (OWS) demonstrations and very little is being said, maybe because very few are even noticing the wrong of it. As a result, people are currently arguing and trying to decide if the OWS gatherings are of anti-Semitic nature. So is it fair to say that Occupy Wall Street is anti-Semitic? I think not! This being said, if OWS is not infected by the virus of anti-Semitism, it most certainly shows symptoms of it. 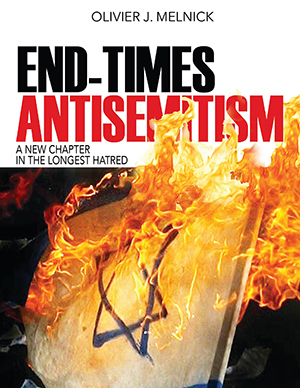 If it is not specifically driven by anti-Semitism, it still is attracting anti-Semites into its ranks. And, as the global economy continues to weaken, a culprit must be designated. Since OWS is mostly made of disgruntled liberal leftists who already have a very warped view of Israel and the Jewish people, the most natural thing for them to do would be to put the blame on the scapegoats of humanity. They are trying to do just that, and who fits the bill better than the “greedy Jew”? While I applaud the Los Angeles Unified School District for firing Patricia McAllister after she said: “the Zionist Jews who are running these big banks and our federal reserve — which is not run by the federal government — they need to be run out of this country”, I continue to worry about my people, mainly because much of what is being stated against Israel and the Jewish people is increasingly reminiscent of pre-WWII nazi Germany anti-Jewish propaganda. Back then we didn’t have a country to go back to. Today, Israel is the safest place for our people and maybe we need to start taking the handwriting on the wall more seriously! A witness who does nothing becomes a by-stander and the by-standers simply facilitate the work of the perpetrators. One February 2010, Israeli Ambassador Michael Oren was invited to lecture about US-Israel relations at UCI (University of California Irvine). Soon after he started, students started to stand and interrupt him shouting statements such as:” Michael Oren, propagating murder is not an expression of free speech”. A total of 11 students stood up and yelled, 8 from UCI in Orange County, but also 3 from Riverside. The students were speaking on cue, even using cards, in what clearly appeared to be a “rehearsed show”. The connection with the MSU (Muslim Student Union) shouldn’t be missed, as they had denounced Oren’s visit hours prior. The same MSU is responsible for organizing a yearly event in the Spring that has been known as Hate-Fest, when they invite anti-Israel speakers, many of them having ties to the Muslim Brotherhood and even the terrorist group Hamas. UCI has the reputation of being the most virulent anti-Semitic campus in America, yet Michael Drake (UCI chancellor) has been quoted to say that there was no such problem on campus. To his credit, he decided to revoke the MSU charter for one year and put them on probation for another year. Thus they did not have the opportunity to organize their annual anti-Israel rallye in 2010. They quickly resumed in May of 2011 with another week of vitriolic diatribes while on probation. Well, we are back to freedom of speech I guess! The anti-Israel rhetoric is nothing but a wolf in sheep’s clothing or anti-Semitism in disguise. That is of course if we agree that anti-Israel sentiment, as the lesser of two evils is indeed the “sheep”, and this is hardly a fact! Almost one year later, on February 4, 2011, the disrupting students were facing charges by the Orange County District Attorney. This was already a small victory against the poison of radical Islam and it certainly didn’t go unnoticed by both Jewish and Muslim communities. This was small but worth mentioning in our politically correct self mutilating society. And yet, the verdict had not come out! On September 23rd, the Santa Ana Court in Orange County, California made their final deliberation and to much surprise, found the students GUILTY. They were sentenced to community service and put on a three-year probation. This is a great victory in the history of campus anti-Semitism. This creates a precedent that will for sure dictate how other universities will and should react to hate speech, anti-Semitism and xenophobia. It sends a message to those who go on spewing hatred, thinking that they will go unpunished. This is one case where “Campus Intifada” has been defeated because there were enough outraged people within and without our legal system, and they were not afraid to speak up and defend the truth. An anti-Semitic group attempted to propagate hate speech by misusing free speech but Judeo-Christian ethics prevailed over radical Islam lack of ethics. Chutzpah prevailed over Sharia and may the momentum continue!